You can’t design a better workplace without first understanding how people work. That’s why we decided to put things to the test in a firm-wide experiment on focus work. The goal? Better understand how employees’ brains function most optimally—and how strategic design can help our clients achieve unparalleled productivity. Read on for our findings. Nearly 60% of CEOs consider creativity to be the single most important leadership skill. In a consumer-driven economy laser-focused on customized solutions, companies big and small must iterate and ideate at breakneck speed. But every day, we face distraction after distraction. Another email. Another meeting. Another impromptu conversation. So much so that employees who do most of their job on a computer are distracted once every 10.5 minutes. Too often, our ability to be creative or innovative at work falls to the wayside as we are bombarded with near-constant interruptions—and that’s not good for business. As our firm’s internal Project Success Facilitator, William’s job is to help every project stay on schedule and on budget—which means getting our design teams all the resources needed to deliver great design to our clients. One of those resources? Dedicated time—and space—for deep focus work, he says. Deep focus work is the ability to spend four or more disconnected and uninterrupted hours a day on a specific task or project. It’s a topic near and dear to William’s heart, one he discussed recently at the annual Virginia Engineers Conference. It’s also why, in conjunction with our Director of Workplace Strategy, Susan Orange, CID, he opted to let our entire firm take part in his passion to better understand the tangible benefits of deep work—and how strategically designed workspaces can support the practice. We blocked off time on our collective calendars and practiced deep focus work twice weekly, which meant we tuned out distractions like email, phone calls, and interruptions from colleagues. Even after only two short weeks, we learned a number of surprising things (and our teams emphatically asked to continue the practice). The biggest takeaways revolved around how we could design an office space that allowed employees to dive into focus work on their own terms and in their own time. While much of the workspace design you see today focuses heavily on collaboration, the ecosystem of a successful office environment is built on a carefully constructed balance of task zones: By utilizing these zones, there’s a clear message: Here’s where you don’t talk at all and phones aren’t permitted. Here’s where small group meetings happen. Instead of arranging by departments, it’s all hoteling space based on the task at hand–collaboration or otherwise. We think collaboration is great—and necessary in today’s sharing economy—but we still need to (gasp) work at work. So the question is: How do you design an office that supports totally-focused and productive deep work without sacrificing the benefits that come from an open office environment. We asked our team of workspace strategists for their insight, and they offered up three impactful design strategies primed for productivity. More and more, clients are asking for smaller spaces scattered throughout a larger open office setting—and for good reason. When done well, it’s the best of both worlds; you get the benefits of an open floor plan and the privacy needed to produce and create. From phone booths for one to smaller breakouts and huddles fit for two to four people, the key is incorporating a diverse selection of options that are removed from the rest of the office—and designing the spaces with human scale in mind. Large, open spaces (like the ones found in so many office spaces these days) have a tendency to make people feel exposed and uneasy. By weaving in smaller, more private options, or even dropping the ceiling height in strategic locations, you can cue the kinds of behaviors most often associated with focus work. Color can be a powerful psychological signal, motivating desirable behaviors in a subtle way. To elicit quiet, focused mentalities, our strategists turn to the dark side—of the color spectrum, that is. These hues suggest to our brains a more intimate, quiet setting, which facilitates hushed conversations between smaller groups of people. Bright, vibrant shades, on the other hand, encourage collaboration and socialization, making them the ideal color choice for areas where communal gathering is encouraged. Color can also be a useful tool to use when designing circulation paths and easy-to-navigate wayfinding. By color-coding high-traffic areas, you can create clear channels for movement, encouraging people to stick to a designated path, and discouraging unwanted impromptu conversations in a zone that’s been earmarked for heads-down production work. Noise control is a critical element to designing a productive workspace: The last thing you want to hear as you’re attempting to crank out that report on a tight deadline is your coworker’s gabbing about what they ate for dinner last night. Thankfully, there are a number of solutions our designers turn to help clients achieve optimal noise levels. People assume an open office will be louder, but that’s not necessarily the case, because with high-paneled cubicles, you can’t see other people, so people are often louder. An open space allows you to see who is working to stay quiet. Incorporating textured fabric panels and upholstery on the walls and ceilings offers more than a design statement and opportunity for branding, it’s also a smart way to dampen noise throughout a large space. In addition, where each zone type is placed (known as planning adjacencies) helps manage noise. “We aren’t going to put a breakroom next to a phone-free library,” says Susan. Conversely, instead of keeping dense collaboration spots out in the open, try tucking them away—especially from those entrenched in deep work. The open/closed office debates fail to capture how focused and nuanced and unique workspaces can be. 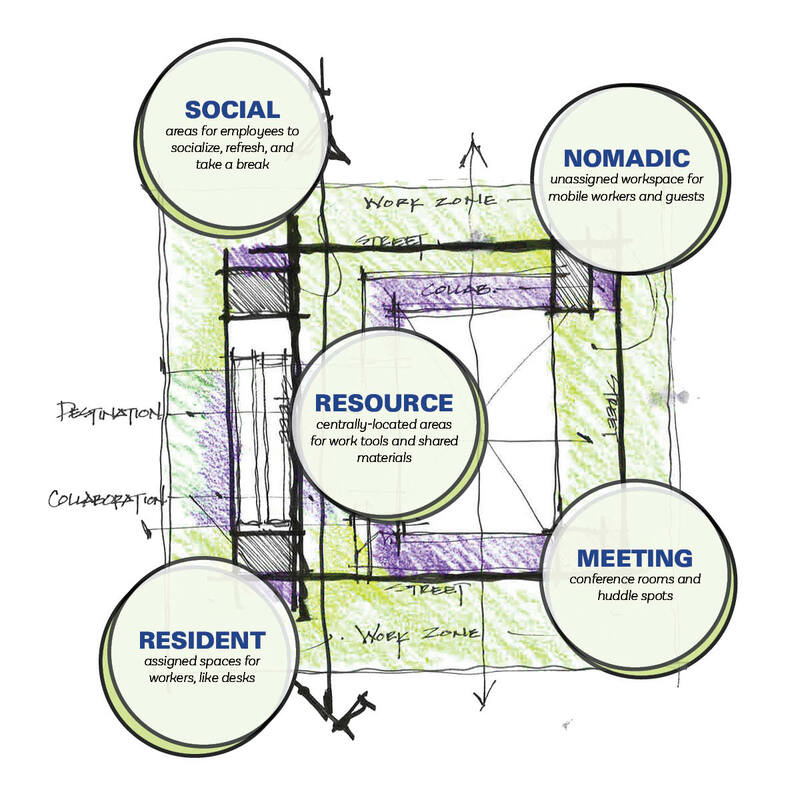 Why reduce a spectrum of possibility to only two avenues: all public or all private spaces? To us, businesses are like snowflakes—and the workspace environment should follow suit. That’s why designers need to focus (deeply) on what really matters: impacting people and processes. This means we have to go beyond open and closed to understanding the very essence of a company’s identity, its core values, the behaviors and preferences of the workforce, and so much more. 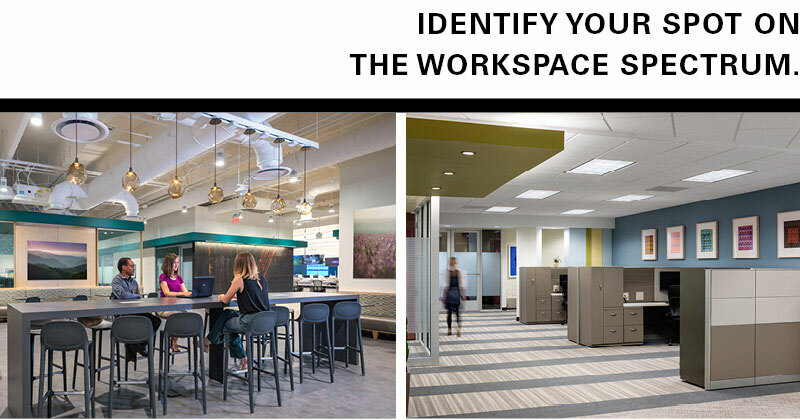 What types of work are being performed in the workspace? How is that work being performed? Regarding the current office layout, what’s working and what’s not? Where has this company been and what’s its vision for the future? The answers to these questions matter. They create an accountable baseline for achieving just the right mix of choice and control for a given company that can be tested and further built upon over time, making every change deliberate progress versus shots in the dark. You want to up your talent attraction and retention rates? Design can help make it happen. All employees need collaboration and growth—and all employers want to foster an atmosphere with a rich sense of place. How employees actually grow and connect with one another differs from company to company. Never settle for a one-size-fits-all solution. Instead, work with thoughtful design partners who can cut through the plethora of possibility for what’s right only for your business—because it’s right for your people and the various ways they work.